Leading Sefton health figures say ‘no’ to sugary drinks! Sefton Council is working with Food Active to promote the new GULP (Give Up Loving Pop) Early Years campaign called ‘Kind to Teeth’. The campaign aims to improve knowledge and raise awareness of the health risks associated with consumption of sugary drinks in under-fives. Developed by registered nutritionists, the campaign has been launched as part of National Smile Month and is the UK’s largest and longest running campaign to promote good oral health. Research shows that by the age of five, nearly a third of children had obvious decay in their milk teeth. In another study, 12% of three-year-olds were found to have evidence of tooth decay having on average three decayed, missing or filled teeth – and sugary drinks are a major part of the problem. This is despite the fact that babies are only recommended to consume breast milk (or formula milk if necessary) until six months and then milk and water are the best sources of hydration for babies and young children. Sugar is not necessary for the diet, especially for children and when consumed in the form of sugary drinks, can cause a whole host of health issues, from tooth decay to obesity and type 2 diabetes. Lots of sugar can often be hiding in many baby juices and other sugary drinks marketed at the early years. 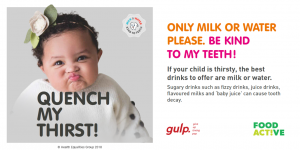 The Kind to Teeth campaign has been developed by registered nutritionists, dental health and early year’s specialists and forms part of the well-known GULP campaign. It is aimed at parents of children under five years of age, to help promote healthier drinking habits in the early years and will involve a number of electronic resources for local authorities to utilise. Cllr Ian Moncur, Sefton Council’s Cabinet Member for Health and Wellbeing, said: “Improving the health of Sefton’s young children is a key priority for us, so I am very pleased that the Kind to Teeth campaign is being promoted in Sefton. Matthew Ashton, Director of Public Health for Sefton and Knowsley, added: “When children are young, we have a fantastic opportunity to influence healthy food and drink patterns, as habits are often established when children are young.